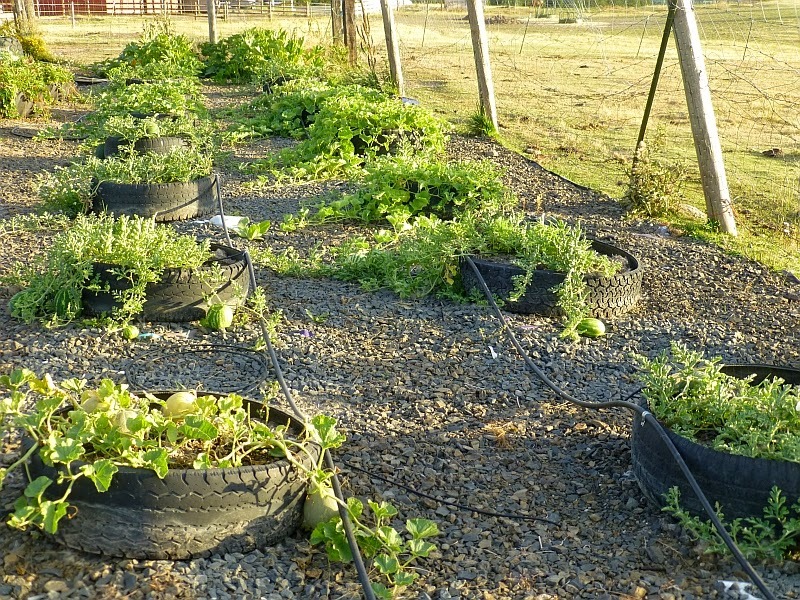 This year our tire garden is doing absolutely splendidly. I can't believe the difference it's made in terms of productivity over planting directly in the ground. 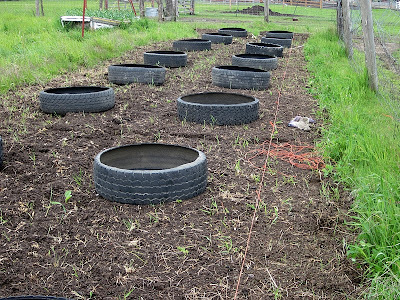 Recently a couple of readers expressed an interest in putting in their own tire gardens, so I thought now might be a good opportunity to relate what we've learned over the years so others can profit from our mistakes. • Hard clay soil that turned into a gooey pudding in rainy weather (no drainage) and baked to rock-hard conditions in dry weather. (Yes, that's my boot sinking in. • Voles, darling little mouse-like creatures that burrow up from beneath and chew roots, strip bark, and cause untold havoc. • Weeds. Oh heavens, the weeds. They are tough, indestructible, and endless. It didn't help that we didn't have a tractor during those nine years. As a force-multiplier, a tractor is essential to move heavy loads and lift heavy things. When the need for a tractor reared its head, we borrowed a machine from kind neighbors. Possibly -- not sure -- if we'd had a tractor of our own from the beginning, we might have had better luck getting a garden established in the ground. We could have plowed. We could have rototilled. We could have moved manure. We could have done a lot of things that were very difficult or outright impossible using just hand tools and our backs. So we had to look outside the box -- entirely outside the box -- to find an answer to our gardening woes. We had some huge beams left over from an old barn we dismantled for someone in our church years ago, and we used the biggest beams to make raised beds for small fruits (blueberries, strawberries, raspberries). Before planting, we put down thick layers of newspapers and hardware cloth to discourage weeds and voles. These beds were a splendid success -- but we had no more beams. We needed a solution that was cheap and easy. What to do? 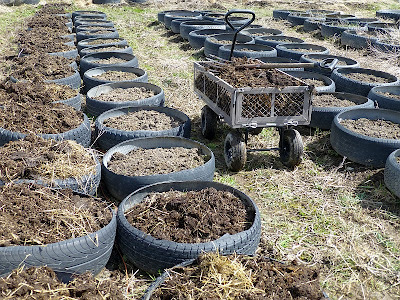 It was Don who came up with the idea of planting in tires. It was one of those head-clunk obvious answers we wished we'd thought of earlier. 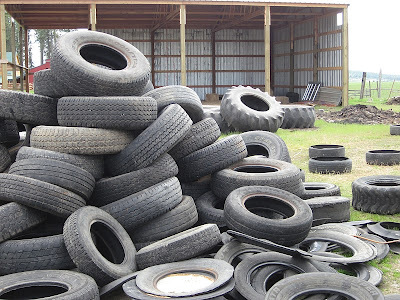 Immediately we started collecting car and truck tires from every obliging source. Fired with enthusiasm, we borrowed a tractor, plowed the garden space, laid out tires in neat rows, and started planting. It was an utter failure. 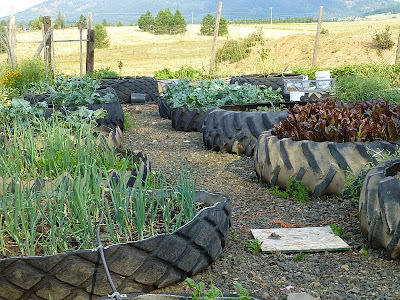 By themselves, even filled with good soil, the tires were useless for weed control -- the weeds just grew straight up through the tires and choked out the vegetables. They also took over the paths between the tires until we needed a machete and pith helmet to walk through. What we needed was a permanent method of weed control. The only way to control weeds on the massive scale we needed for a garden was blockage. Eventually we settled on using billboard tarps anchored with gravel. Originally the gravel was merely to anchor the tarps (and cover the colorful pictures), but as a happy secondary benefit, the gravel provided superb drainage for tires. By this point we had transitioned away from smaller car/truck tires toward large tractor tires -- and some of these were already in place. When we started laying down tarps, we didn't remove the tractor tires but just cut holes and fitted the tarps around the existing tires. This proved to be a mistake. Since the tires were just on bare ground, they've continued to be plagued with weed issues. Over the years those issues have lessened since I'm ruthless in eradicating whatever weeds grow up through the tires, but I could have saved myself a lot of trouble if we'd just laid the tires on top the tarp/gravel to begin with. This might be a good time to distinguish between raised beds and raised containers. Raised beds are open to the ground. 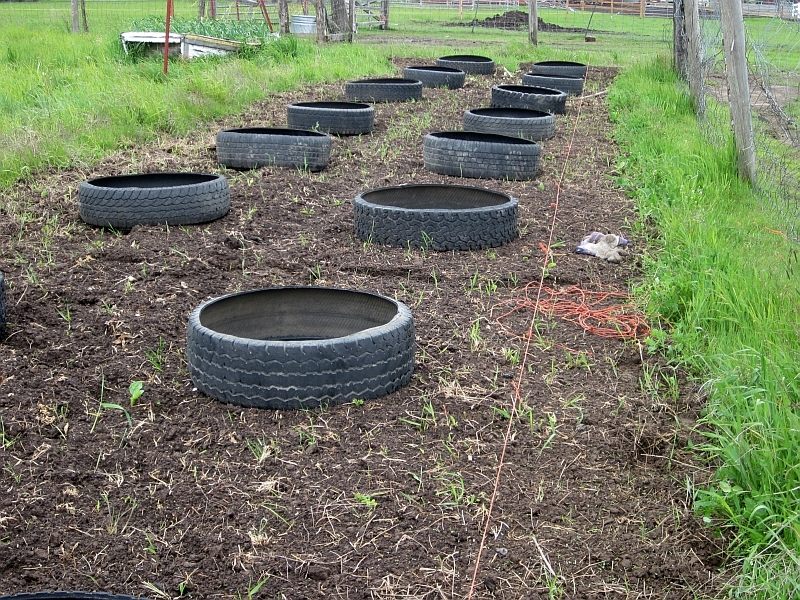 Raised containers have closed bottoms (though still permitting drainage). Technically our tire garden is a raised container garden. 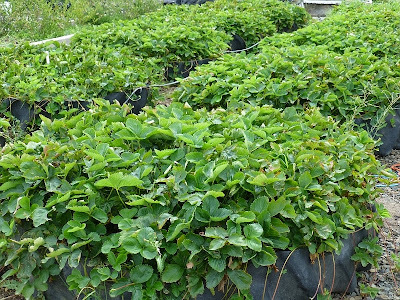 There remains, also, the myth that planting in tires will result in poisoned plants. Please read this post to set your mind at rest. 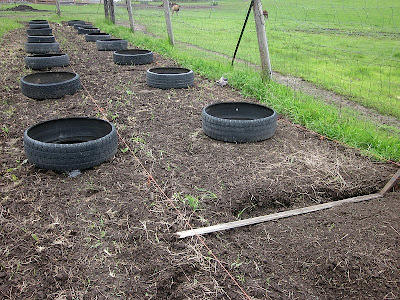 So if anyone is interested in started a tire garden, profit from our mistakes over the years and start with some way to block weeds on a permanent basis while still providing drainage for the tires. Our solution was tarps/gravel. We know some people who are using sheets of corrugated tin. 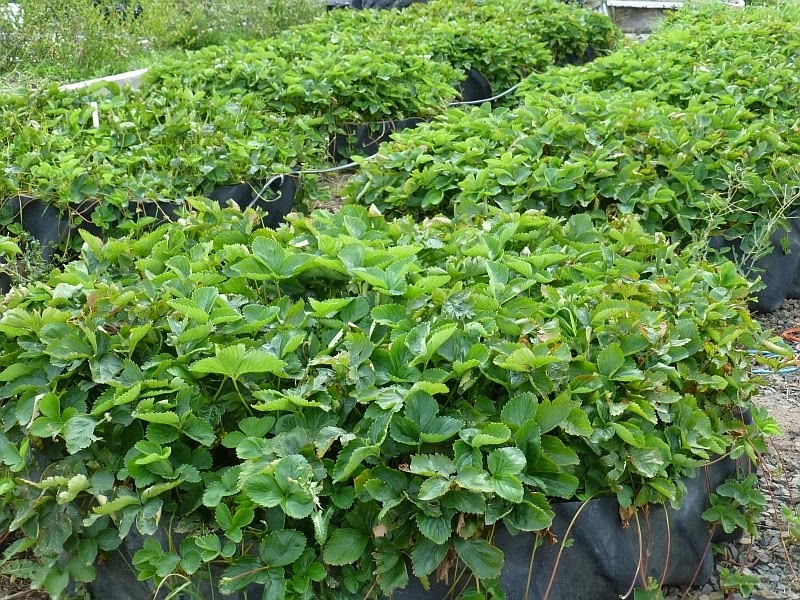 Whatever solution you choose, the combination of weed control and drainage is critical. In other words, don't put tires directly on the ground or you'll never be able to control the weeds. I like how they look! All the hard work and unsuccessful parts paid off!! Great recap of your tire garden..not that you grow tires.. I read "Backwoodsman" magazine and they were asking for an article about tire or container gardening. You would be the perfect writer for their publication.. I enjoy your blog so much. Thanks for your great info. Amen! What a wealth of information and blueprint for action. I did what I call a combo lasagna/raised bed garden this year, and it is so far working out wonderfully. And we have heavy clay soil. I put cardboard down last fall where I wanted the garden. Topped with leaves/grass clippings. In the spring, topped with a combo peat/topsoil/compost. Planted in that and mulched with wood mulch. I will be repeating the process for next year, in a new area (to keep the stupid beagle out of it, he's done more damage than the wild critters). We don't have as much room as you, but I love the ingenuity and how you have made it work! For what its worth, I've done smaller tires with a circular saw, not quite as neat a cut, but a bit easier to use. Also, if you're doing rows of tires, don't put them RIGHT up against each other. Space them out at least a bit. Extra especially if you're only putting a weed barrier under the tires directly and not the rows in between. Extra extra especially if you plan to mulch or gravel the rows. 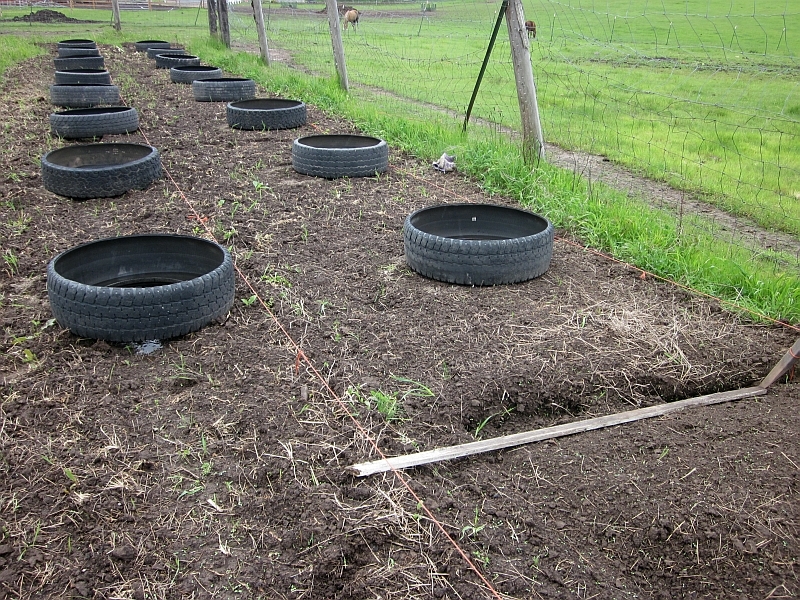 The touching tires creates a corner that the mulch or gravel won't fill properly and weeds will LOVE IT. LEarned that the hard way! This question doesn't quite fit with tire gardens, however I figured this would be a good place to ask my question. I have been trying to grow potatoes in a container, it's one of those large tubs with rope handles, last year all I grew were weeds, this year I have tried again, so far they haven't come up. My brother told me that our Mom would use potatoes that had sprouted and had quite a few eyes from the previous years harvest, she would cut them up and plant them. He said that she did one more step, she soaked them in formaldehyde, is this something that is done? !!! I've never heard of soaking potatoes in formaldehyde before planting. Personally I would think that would **prevent** growth, but then I've never tried it either. Does the tub you use have holes at the bottom for drainage? All plants need proper drainage. Your mom is right, potatoes grow from sprouts and sprouts grow on potato eyes. Grocery-store potatoes have been treated to discourage sprouts (for obvious reasons), so if you're just starting out, it's best to purchase "seed potatoes" from gardening centers. Potatoes are best planted in spring (late April or so in our area) and harvested after the first frost. Potatoes should be planted fairly deep, four to six inches down, and they can take a long time to push their first leaves upward, far longer than you might think (a couple of weeks or more). Thanks for your response, the advice will come in handy, as for drainage, I have the bottom part of the tub covered with rocks so as to not have to use so much dirt, I figured this might be good enough for drainage, if not, well not much harm done that can't be fixed by making some holes if need be, I did plant them about 5-6 inches down, as for the idea of formaldehyde I have to agree that it would seem to be not a good idea, although apparently it is an anti-fungal which is something that it talks about having to combat when planting potatoes, however I also didn't think this sounded like such a good idea. It would appear that I am being a little impatient to see new growth, I planted them a bit late, Mom had advised to plant things after Mother's day around here and I am not the fastest when it comes to getting around to things so they didn't get planted until about a week ago, guess I'll just give it a little more time and hope for the best and if it doesn't work this year, I will try again closer to May next year. Thanks again. Oy, if you only planted them a week ago then I'm afraid you won't get any potatoes this year, unless your growing season is a lot longer than ours. Potatoes take a long time to mature and should be harvested after the first frost. You'll get greenery, but your potatoes will only be about the size of marbles by September or October. Next year plant in late April/early May. I think that may also be the case, although I may be able to have a dish that I so very much love, creamed peas and potatoes, we used the baby potatoes for that dish, also it's quite possible that if winter holds off like it did last year here, I might be able to harvest in late December, I have also been experimenting with trying to overwinter them, although that failed last year, I had the added blessing of really rich compost from the pot, it does seem like because we are kinda south of where you are that you begin your winters a little earlier than us, so who knows, if nothing else I am learning from my mistakes, lol.